Adventist Development and Relief Agency (ADRA) Malawi has sent a congratulatory and good will message to its Ex-Country Executive Director Dr. Michael Usi who resigned to join frontline politics. This follows UTM presidential candidate Saulos Chilima naming his runningmate to be Usi, director of strategic planning in UTM Party who now becomes the party's vice-president as per the UTM Party constitution. "Congratulations Dr. Michael B Usi ( former ADRA Malawi Programs Director ) for being appointed the official presidential running mate of United Transformation Party in the forthcoming Malawi Tripartite elections 2019. God be with you" reads a brief message posted on ADRA website..
Usi holds a doctorate from the University of Bedfordshire in the United Kingdom. He is also widely known by his nickname Manganya, a character in the Tikuferanji series. He is basically an actor and playwright, besides working as a corporate executive. The position of Usi at ADRA was taken over Hastings Jabulani Lacha. Blantyre-based political commentator and strategist Humphreys Mvula described Usi as a technocrat with experience in humanitarian work, civil society well educated and with a clean track record in as far as the politics of the country is concerned. Meanwhile, Chilima appealed for support of UTM presidential ticket , urging Malawians to "allow a new generation to take charge". 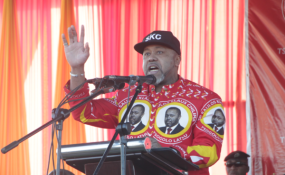 Chilima said the elections offer Malawians "an incomparable once-in-a-generation" opportunity to fix the country and set it going. He said: "We must pull down the cobwebs of corruption and nepotism and unleash this nation's true potential."